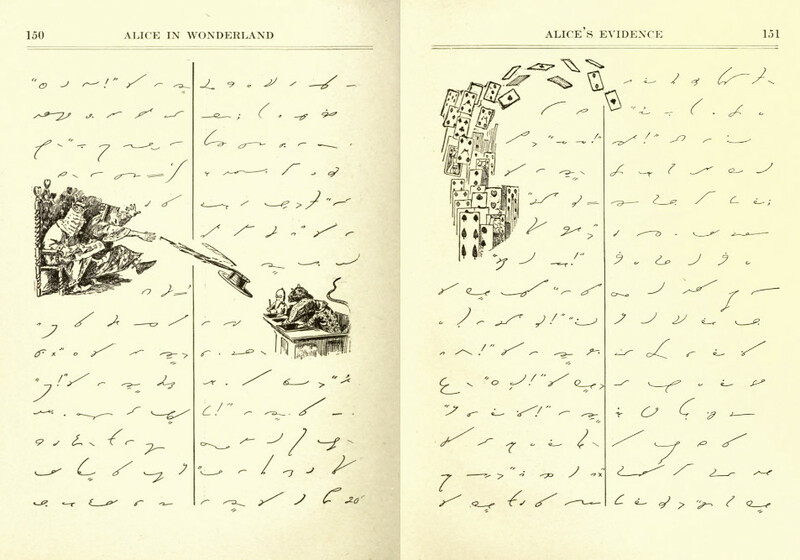 Lewis Carroll, Alice in Wonderland, translated by Georgie Gregg; New York, Boston, Chicago, San Francisco: Gregg Publishing Company, 1919. Sir John Tenniel’s famous illustrations might be your only guide through this edition of Alice’s Adventures in Wonderland. 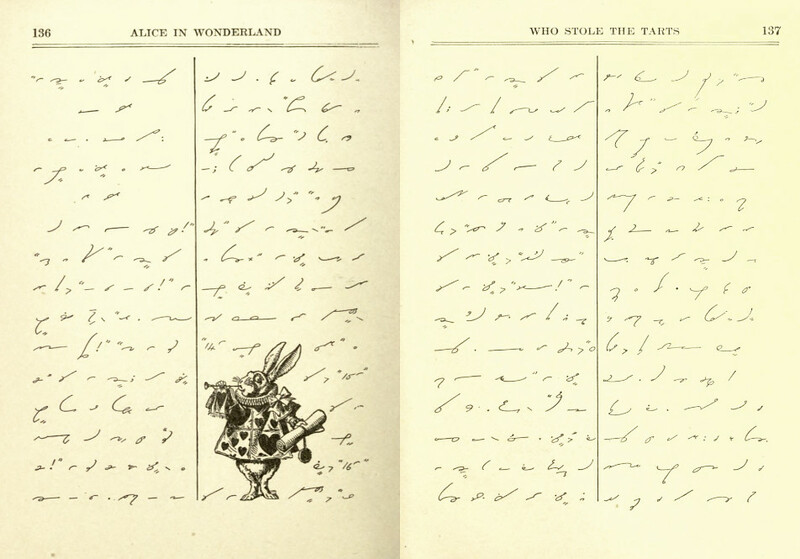 His small engravings mark various moment in Alice’s adventure, small islands of illumination in a sea of otherwise obscure text: from when Alice drinks the potion to when she goes to tea with the Mad Hatter to the final court scene with the Queen of Hearts. Bar the running headers, the surrounding text will remain entirely opaque, that is, unless you are blessed enough to be able to decipher shorthand, here transcribed along the system of John Robert Gregg by his niece Georgie Gregg Gingell. First published in 1919, the book saw a second edition in 1931 which was refurbished with a newly updated system of Gregg shorthand published two years earlier. Shorthand has a long history: used by (or to preserve the work of) everyone from Cicero to Luther to Shakespeare to Pepys. 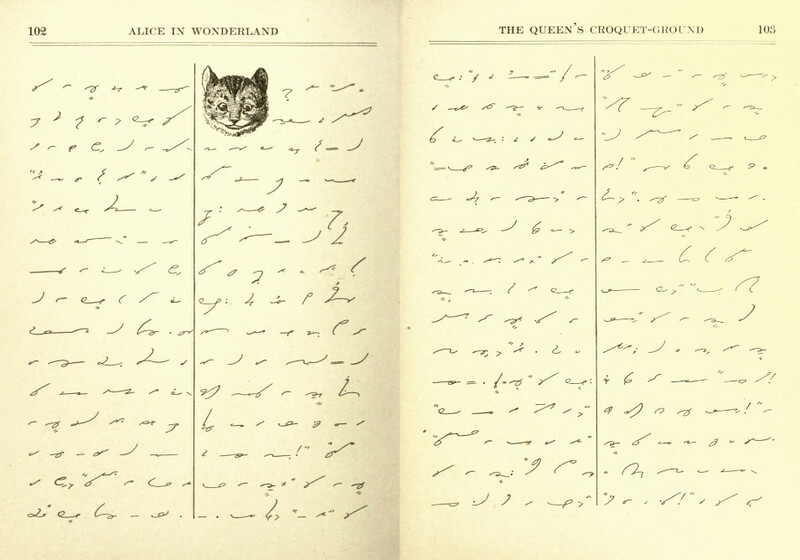 Gregg’s version of shorthand represented one of the systems vying for supremacy at the end of the nineteenth century. It was based, like most methods, on the principal of “phonography”, where sound (phone–) is depicted in writing (–graphy). The purpose of shorthand was to condense the act of writing: to shorten and to quicken. 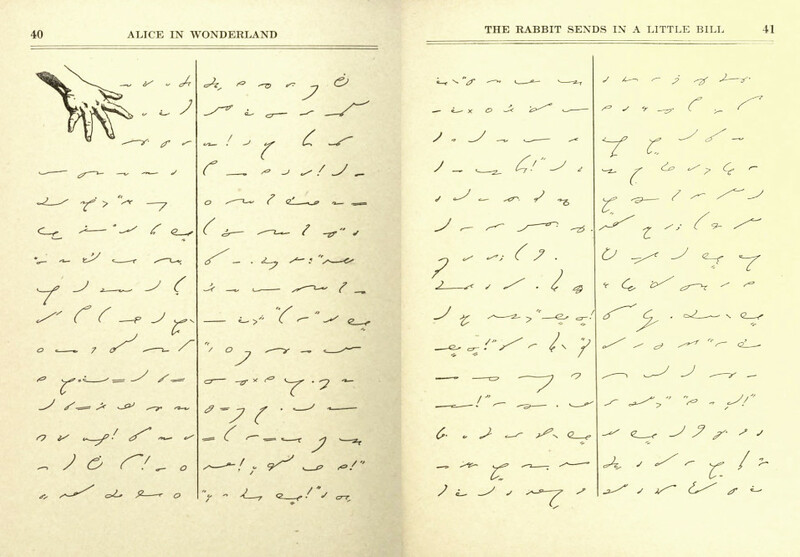 At the end of the nineteenth century, at a moment of rapid development in bureaucratic and clerical structures, shorthand promised speed; a system where the hand could keep up with the pace of both thought and speech. Gregg developed not only his method but a publishing house too, the Gregg Publishing Company that spread across the English speaking world. This utilitarian function of shorthand sits a little oddly perhaps with literature, given the novel or the poem is a form associated with a different realm: that of leisure. This didn’t stop Gregg rendering great classics into his enigmatic script, from Hamlet to The Legend of Sleepy Hollow. 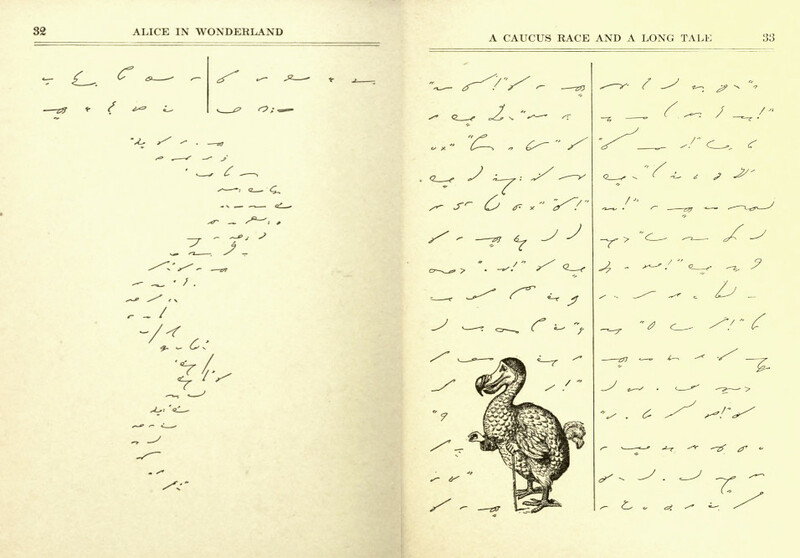 Of all the works given the Gregg Publishing Company treatment it is Carroll’s Alice in Wonderland that stands out for particular attention, it being a text that already plays with the tension between the written and the spoken, between sense and nonsense, and which seems, at its heart, to rile against the rationality and economy that underpins the shorthand project. Carroll had died in 1898, a decade after Gregg’s first publication of his phonographic system. One can only imagine that he would have approved of the transposition of his fantastical story into a new system of signs.